Is it difficult climbing Island peak. A loaded question, but one we can break apart and analysis the different elements of an Island peak ascent. It might be easier to assess if you can take on this climb if you can look at all elements of the challenge. First watch this video and see the different types of terrain you will encounter. Read some REVIEWS from our trips. So you can see the footage from high on Island peak. 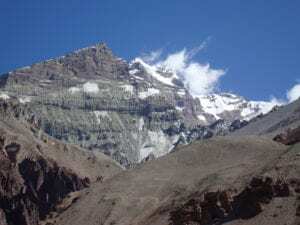 Remember you have taken 12 days of trekking and acclimatizing on route to Island peak base camp at 5,100m/ 16,732 feet so trekking to Island peak base camp is a challenge in itself that requires good physical conditioning. READ MORE about our advice on trekking in Everest base camp which encompasses Island peak base camp. 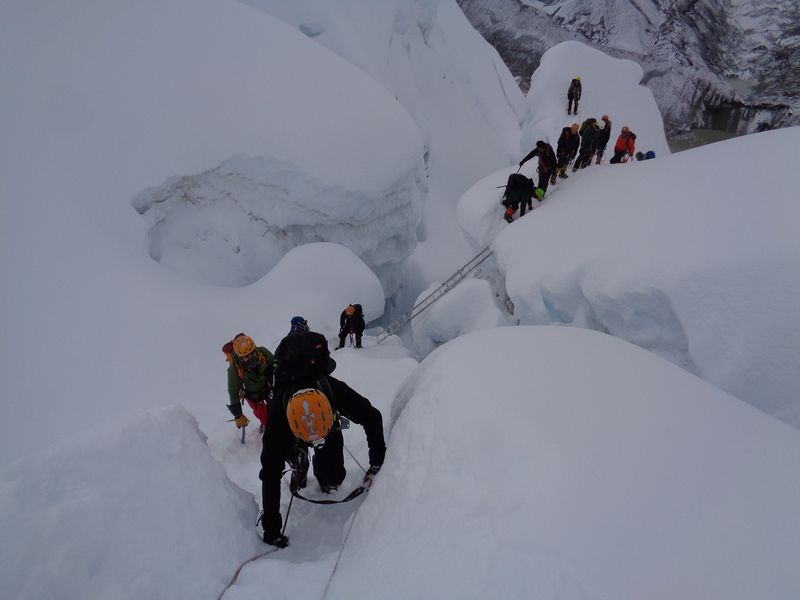 Check out our SPECIFIC TRAINING for climbing Island peak. So there are a couple of major challenges with climbing Island peak. 1). You need to have a good understanding of mountaineering. look at the video again you have to be able to climb through a glacier Alpine style (roped to other people) cross crevasses, sometimes on ladders. You will also be using crampons, harness and ice axe. 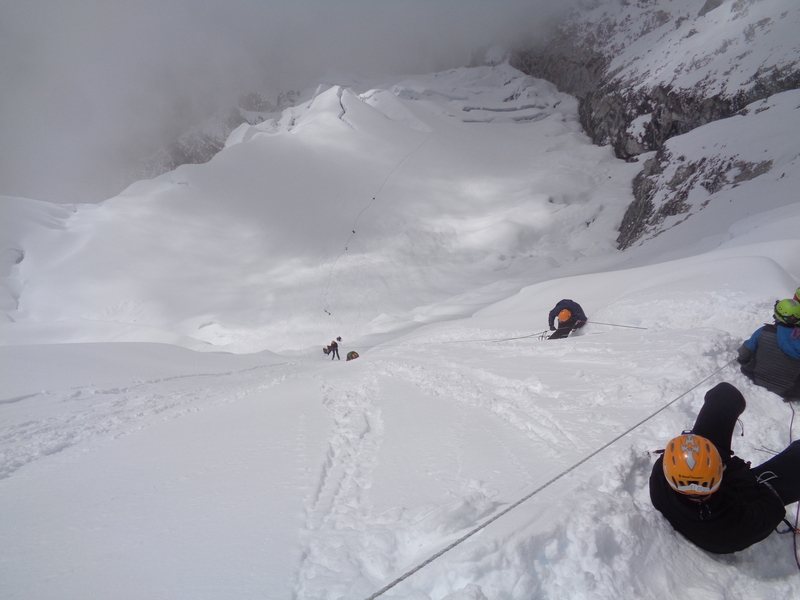 You will then be climbing on a fixed rope that we set up the mountain at 6,000m/ 20,000 feet and then abseiling down on a fixed lines using a figure of 8 as you move from one anchor point to another. Do you feel comfortable doing this and using all these pieces of equipment? If the answer is yes then you should have the technical ability. If no you have some work to do. 2). Have you been training 5/6 days a week for over 6+ months with previous altitude and mulit-day trekking experience? You are going to be hiking up to the crampon point at 5,800m/ 19,000 feet on Island peak, climbing at 6,000m/ 20,000 feet on 45 to 60 degree angle. Trekking and climbing for 18 days in a row. You need to have excellent physical conditioning. Strength, endurance and fitness to be able to manage yourself correctly at this extreme altitude. READ MORE here about the specific training required for climbing Island peak. Island peak is a demanding climb at extreme altitude and do not underestimate the climbing or physical challenge. We want to see you come fully prepared so you can be safe, comfortable and have an amazing experience. I have climbed Island 10+ times and we have led 40+ Island peak expeditions over the years. We have the same team on each climb and we know how to help you achieve your goal of getting up and down Island peak. CONTACT US and learn more about what it takes to reach the summit and get back down safely again.